Steca Solarix PRS - it offers a simplicity and high performance, modern design and a convenient display. All of that it makes it particularly appealing. Several LEDs in various colours emulate a tank display, which gives information on the battery's state of charge. Here, Steca's latest algorithms are employed, resulting in optimal battery maintenance. The Solarix PRS charge controllers are equipped with an electronic fuse, thus making optimal protection possible. They operate on the serial principle, and separate the solar module from the battery in order to protect it against overcharging. Тhere is an option, charge controllers to be equipped with special functions: e.g. with night light function, deep-discharge protection voltages and etc. 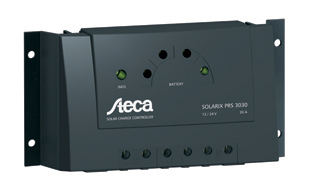 More about Solar Controller Steca Solarix PRS 3030 - 12V/24V, 30A .